October is here, but I’ll show you some photos from last month. For those of you who don’t keep up with such trivialities, I can reveal that we’re talking about September. Nothing exciting happened in September, but I did manage to take a bunch of photos after all. «The Changing Seasons» is a monthly photo challenge with a few basic guidelines. I started the challenge in January with photos that I shot in December. Find a location near your home. Each month take somewhere between 5-20 photos and post them in a gallery in your blog (I’ll post mine on the 7th, but you can choose your own publishing date). 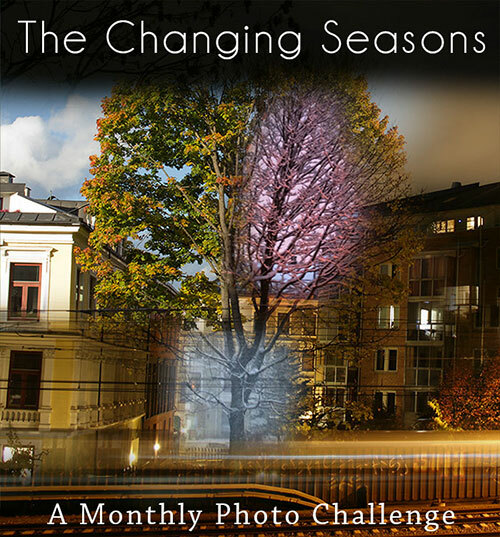 Tag your posts with #MonthlyPhotoChallenge and #TheChangingSeasons (this makes it very easy for others to follow the challenge using the WordPress reader if your blog is running in the WordPress platform). This entry was posted in Cityscape, Norway, Sports & Activities, Street Photography and tagged #MonthlyPhotoChallenge, #TheChangingSeasons, cityscape, landscape photography, Night photography, Oslo, September 2015, street photography. Bookmark the permalink. Very nice. I particularly like shot of the boats with the house with the smiley face up in the wooded hill. Thanks David. I didn’t notice the smiley face before you mentioned it. Thanks Babe. It’s a great place to shoot it from, I’ll definitely return there. Stunning pictures, as usual. You are setting quite a bar for the rest of us 🙂 Mine will be up on Thursday. It just happened I was out shooting today. Thanks for the nice comment and entry Marilyn. There is a real richness to these shots Max – beautiful. Beautiful photos all round, C. Hard to pick a favourite. I thought the eclipse was very well done. I’m sure you planned it out before that shot, and the super moon one too. These things don’t come by that often. Seize the moment. Another great selection, and a great idea re Flickr, I think I will do the same, once I have got out and taken my October shots, it’s a miserable cold wet day today so the industrial jungle in which I live should look nice and grungy today! I got some nice October shots yesterday for next month. Finally I have a few autumn photos, so now I can take a break for the rest of the season! Hehe. Loved your gallery! Yes, you’re right. I used a filter on the water photos. If you don’t have a filter, you can take several exposures and combine them in Photoshop. Thanks Joanne. I used a filter so that I could take longer exposures on the running water photos. A great series of shots Cardinal, so many beautiful reflections! you have wide spectrum of subjects. amazing as always. I think Frognerbekken is my favorite. I can’t believe it’s almost end of the year.where did 2015 go??? those reflections are stunning… do you use any special filter for those? the water photos are so nice. Ten months! Hard to believe, isn’t it? I also found September to be a mediocre month for shooting. Most of 2015 for that matter. Hopefully things will pick up soon. As always, I LOVE your photos! As usual you post a beautiful gallery. Barcode is my favorite this month. A nice collection of some of your many fine photos!! Truck vs tram looks scary! Beautiful shots. I love the one with the still water in it.